A Soyuz-2.1a rocket booster being installed on a launch pad at the Vostochny cosmodrome. The Soyuz-2.1a rocket, with three Russian satellites on board, is being launched from the Vostochny Cosmodrome in Amur on Thursday April 28. The launch will take place from the site’s only existing launch pad. The first launch from the Vostochny Cosmodrome, still being built in the Amur region, is due on Thursday April 28. 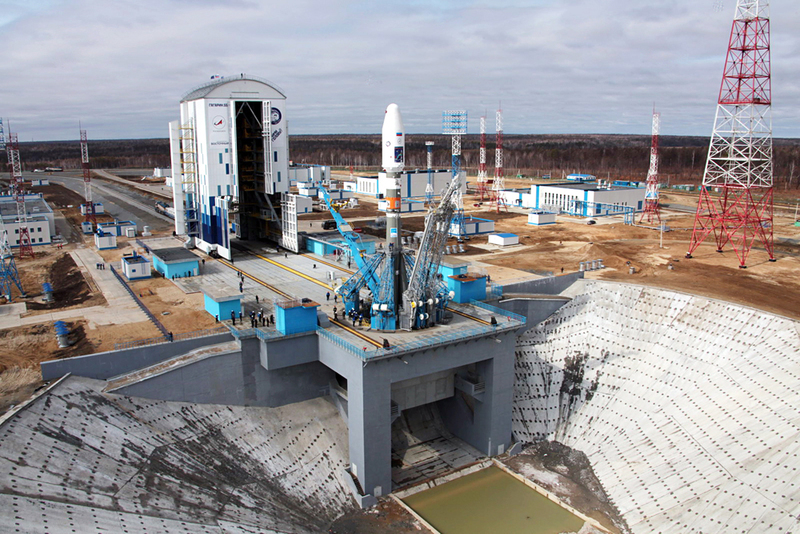 The Soyuz-2.1a rocket, with three Russian satellites, Lomonosov, Aist-2D and SamSat-218, will be launched from the still under construction Cosmodrome. The launch was originally planned for the last year, but the date was postponed to complete the infrastructure. The carrier rocket Soyuz 2.1a has been upgraded to be launched from the new spaceport. "Instead of silver-zinc board batteries, which requires a long charging cycle on a dedicated charging station, it uses nickel-cadmium high-readiness batteries," said Alexander Kirilin, head of the Progress Rocket and Space Centre in Samara, which manufactures the Soyuz rockets. The rocket has also been equipped with video cameras to record the take-off and broadcast live video on the Internet. The launch facility is equipped with a special mobile service tower that protects the rocket, as well as equipment and people from wind and rain. Due to the launch pad's design, the rocket at the Vostochny Cosmodrome does not stand vertically, as at majority of the world's spaceports, but is hanging. Additionally, the new Russian spaceport or space station is the first in the world where the command centre is not underground, but on the surface near the launch complex. Vostochny has decided to continue the tradition begun originally at Baikonur: Ahead of the launch, the rocket will be blessed by Bishop Lucian of Blagoveshchensk and Tynda. The village of Chagoyan in the Amur region will be evacuated for the duration of the first launch, but a third of the local residents have refused to leave their homes. A stray cat living under a construction trailer about a hundred metres from the launch pad will also be evacuated. The cat was brought and left by one of the workers. "He will be able to watch the flight of the rocket from a safe distance," said a source who is in charge of the Vostochny Cosmodrome's first cat.